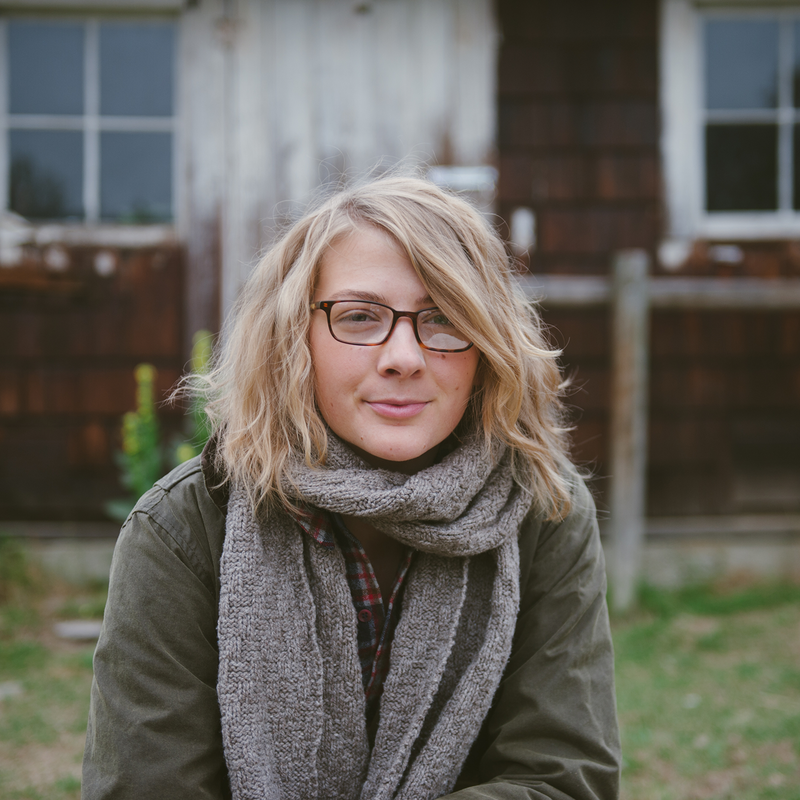 Sponsor: In 2013, Anna Dianich opened Tolt Yarn and Wool. a local yarn shop in the beautiful Pacific Northwest town of Carnation, Washington. Last Fall we celebrated Tolt’s second anniversary, with the release of a very special book, Farm to Needle: Stories of Wool. When we pick up our needles and cast-on the first stitch, we become part of something much bigger than the project at hand. Farmers, shearers, spinners and dyers are working hard not only to produce the yarn we love, but to preserve a way of life that is at real risk of being lost. Farm to Needle invites you to join a journey; to peek behind the scenes of some of our favorite producers and gain a deeper understanding of the people, places, and animals at work. Discover Aspen Hollow Farm, Green Mountain Spinnery, Imperial Stock Ranch, Thirteen Mile Farm, YOTH, Saco River Dye House, and Twirl through patterns by Dianna Walla, Tif Fussell, Veronika Jobe, Karen Templer, Andrea Rangel, Annie Rowden and myself. This book was beautifully captured by a hardworking team, lead by Anna and Kathy Cadigan. 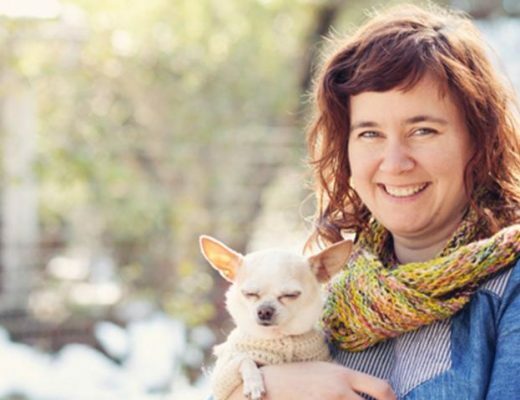 March is Icelandic Wool Month at Tolt, and to celebrate they’re hosting classes by Cirilia Rose and Andrea Mowry along with an Icealandic Knit-A-Long. You can find details on their blog. Stopover Fun! from Mary Jane Mucklestone on Vimeo. 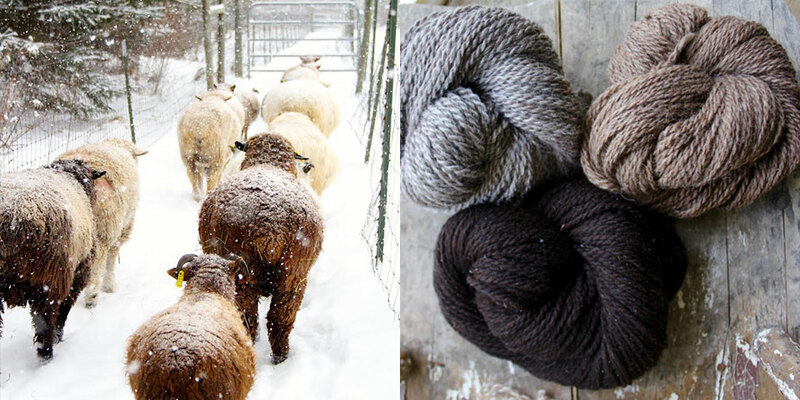 Sponsor: Wing and a Prayer Farm is a fiber farm with beautiful pastures in Shaftsbury, Vermont and maker of some of the most delicious Shetland and true farm yarns I’ve had the privilege of using. The owner and operator of Wing and a Prayer farm is Tammy White, an incredible woman with a huge heart for both human and animal and everything in between. I’ve had the privilege of watching part of her fiber journey unfold as she shared a bit of her story in Episode 16 and has taken such care in creating a collection of yarns from her fiber flock which consists of Cotswold, Cormo, Shetland, Corriedale, Merino, Mohair and Alpaca…resulting in fibers that are a pleasure to knit with and wear. Last month Annie Rowden of By Annie Claire released a beautiful new pattern, Earlyrising…a cabled hat designed with Wing and a Prayer’s Shetland yarn, a rustic yet soft 100% Shetland wool. This hat is the perfect ‘let’s get the chores done’ kind of hat, full of texture and all over intertwining cables. You can find Tammy and Wing and a Prayer Farm at wingandaprayerfarm.com and on Instagram @wingandaprayerfarm. Giveaway: The winner of last week’s giveaway is, Robin Ham, you’ve won 3 issues of Amirisu magazine, congratulations! This week’s giveaways are sponsored by Wing and a Prayer Farm, by Annie Claire and Mary Jane Mucklestone and we’re giving away a Earlyrising hat kit which includes the pattern and two skeins of Wing and a Prayer’s Shetland yarn. We’re also giving away a copy of Mary Jane’s book 150 Scandinavian Motifs. To enter this giveaway, leave a comment on this blog post. 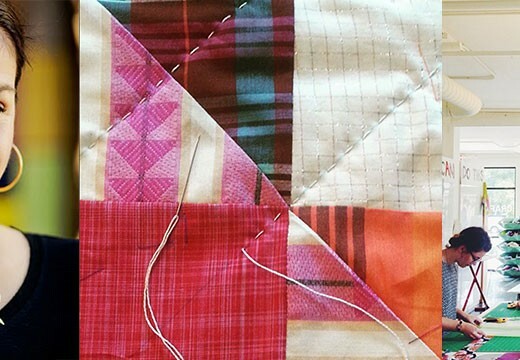 Very excited to listen to this episode — I love MJM’s books and patterns!! Should be a great story, love Mary Jane! I am convinced that this sort of colour work will keep me warmer in our subarctic winters. Can’t wait to listen! What a great interview! Mary Jane has led such a fascinating life! 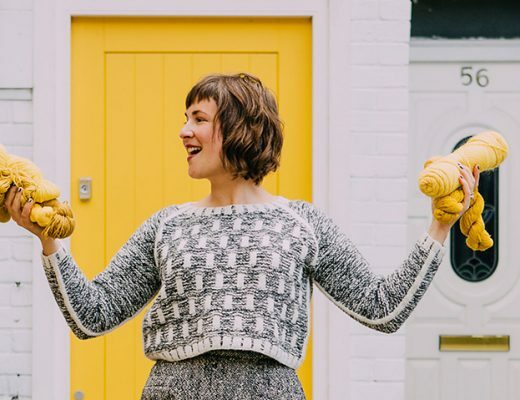 I’ve just found your podcast and listened to the last one on Amirisu and now this latest…what fun to hear the lives and adventures of knitters…and what’s out there. love to hear about the merchants, farmers, designers, etc ! thank you. Really excited about this episode! Thanks for such an inspiring podcast. Congrats on your 50th podcast. I’ve enjoyed each and every one. Thanks for all your hard work! What an amazing story! Really enjoyed listening to it. I love her designs and just got her book of 200 Fair Isle motifs for my birthday. Thanks for sharing this great interview with us! Oh my, I would so love to go to MJ’s and Gudruns’ Shetland trip. Some day. When I grow up! Very nice interview, thank you! I could listen to her all week long… Also thank you for the podcast archive, I had wanted to get to some of the early ones but it was impossible. But now I will! Love. Those shetland trips sound divine. I would very much want to go there and to Scotland in general specially affter watching outlander. I’ve been following Wing and a Prayer farm for a while, and would LOVE to knit this hat and feel their beautiful yarn after following the animals on Instagram for so long! And I would LOVE to go to Scotland, too! Thank you so much for always bringing us such joy with your podcasts. I listened to the podcast earlier today and I enjoyed hearing Mary’s story. What a wonderful prize this week! I loved hearing MaryJane’s history! Especially after knitting her Stopover Sweater in a week. I used to have a pair of jeans in the 70’s that were more patches and embroidery than denim after a while. I wish I had kept them! Those guided trips sound amazing!! That would be a dream to attend one. First time listening. I will definitely be back for more! I’m lucky enough to have taken an in-person class with MJ and to have visited Tolt a couple of times! I’m very excited about this podcast! 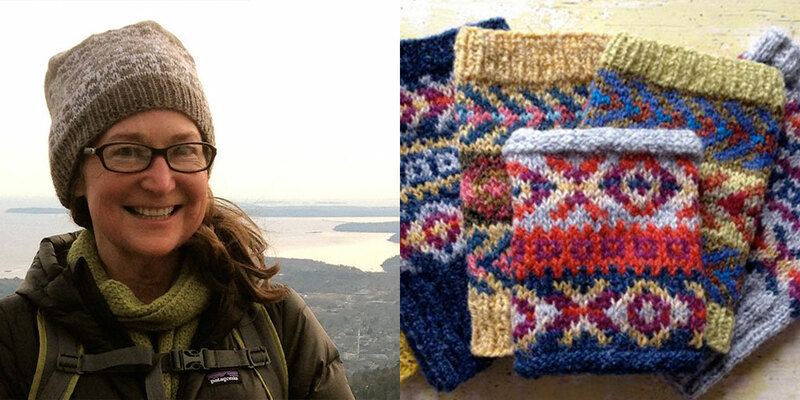 MJ’s Craftsy class on knitting a fair-isle vest is also fantastic if you can’t get to take a class from her in person. Well now I really want to go on a fibre tour. Wish I had the funds this year, my mom loves hiking and wool, would be a great one for her. Thanks! Loved this podcast! Thank you! What a great episode! I love Mary Jane Mucklestone and admire her so much. 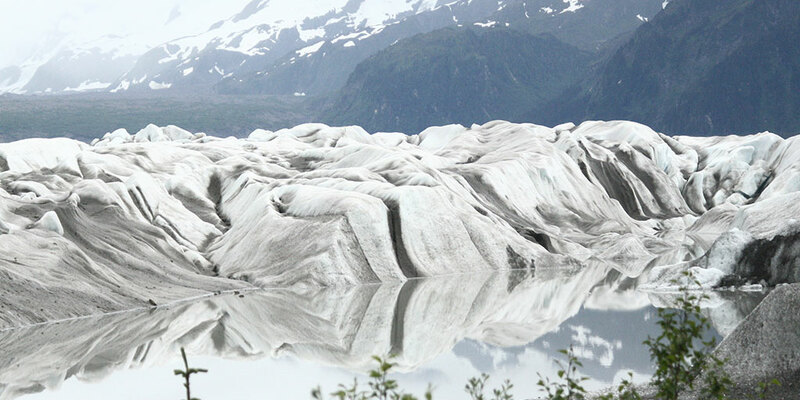 I am also determined that someday I will go on one of the retreats she and Gudrun Johnston hold each year. And OMG, Little Kiddles! I still have mine! lolol! MJM’s designs are what got me interested in learning color work. Thanks for putting together the podcast! Brilliant, as always. Love MJM and her work so this was a really treat. Have listened twice today, on the tube going into London for work and now, on my way home. Thank you as always. I am DROOLING over everything in this post. Thank you for such a treat! What a delight to sit here in rainy Seattle listening to your fabulous stories about your trips and journeys in the wonderful world of wool! Looking forward to your next exciting travels and hearing all about them! I learn so much from you and reading your books has made me a better knitter. Thank you, Mary Jane! I’m really looking forward to listening to this interview with MJ. I find her colorwork awesome and inspiring. I have been to Scotland, but Shetland is on my bucket list! What a great episode. I am trying to figure out me schedule so I can go Shetland with one of the tours that she leads. Such an amazing giveaway. I’ve gotten into color work in the last year and just love it. Like a lot of folks I just finished knitting a Stopover. It was such a fun knit that I can’t wait to hear more about the designer. Thanks again for putting together such interesting episodes! I love how many of my fellow Mainers are so involved in the fiber community! What a lovely episode. Thanks! What great adventures! — And what a talent! What a wonderful fiber journey. I really enjoy your podcasts. I would love to go back to Scotland – when I was there in the 90’s, I was not interested in yarn and knitting. Now I would enjoy the scenery AND scout out yarn! On a different note, I’d love to win the book – it is actually on my Amazon list. So jealous of all of Mary Jane’s adventures! I’d love to try this yarn. Thanks for the chance to win. What a great interview! MJM has had such an interesting variety of fiber experiences –and so charming, too! So interesting to hear Mary Jane’s story! I love her work. Just finished my Stopover sweater, so it was perfect when I saw she was on the podcast! Every day is an adventure when you knit and love yarn and the places it’s grown and made. Looking forward to listening to this one. This was such an inspiring interview, I’ve always admired MJM’s work but to hear her excitement in her own voice had me looking at doing many new things this year, thank you both! Your Podcasts are opening new worlds to me – suddenly I ask so many more questions about the yarns I use, about how they came alive, about their history… Now I want to travel to Scotland 😉 and shouldn’t I feel very lucky that I live just around the corner in Germany? What a great episode. Winner or not, I want to pick up a copy of her book! What an interesting life and knitting journey. Thanks for the interview and for MJ sharing your time and story! I thoroughly enjoyed this episode. Mary Jane is a fascinating woman. What a life! What a career! What a designer! Thank you for the in depth and interesting questions. The photos that accompany this episode are so beautiful — can’t wait to hear the podcast that goes with them! Beautiful show. Thanks for the great interview. I loved hearing about her childhood. I would love to own this book in my library. So interesting,nice to learn about Mary Jane. A fiber trip with her will go on my bucket list. This has been one of my all time favorite episodes of Woolful. Heres to many many more….please. Wonderful episode as always! Itching to go on one of the trips to Shetland! Episode 50! Congratulations! An inspiring listen, as always. I enjoyed this so much! Loved getting to know more about Mary Jane. On my bucket list is to go on one of those trips with her and Gudrun!! 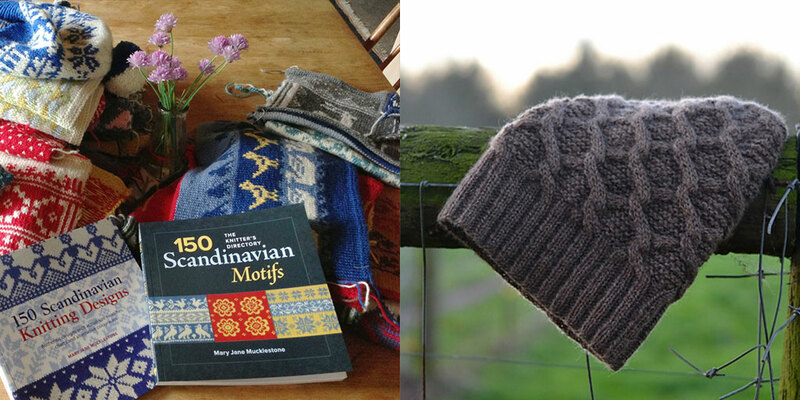 I have a friend who is going to the John Campbell Folk Art School later this month for a 5 day Scandinavian knitting workshop led by Mary Jane. Don’t we all wish we were going!! Would love to win the yarn and pattern. I’m going to listen to this episode while I work the last few rows of my Stopover sweater. Can’t wait to hear more about Mary Jane. The Shetland Adventure has been on my wishlist for sometime! I am about to start some colorwork! So excited! journey. I love your engaging style, intriguing guests and thoughtful, creative sponsors. Oh, I want to go on a Shetland trip SO BAD! It seems like the best of ALL worlds. I need to jump on the Tolt Icelandic Wool Month bandwagon and cast on my Karusellen hat in some lovely Lopi purchased at Tolt. Great podcast. So thoughtful and entertaining. Wing and a Prayer Farm is divine. Another great episode. Thanks sharing. Listening to Mary Jane was great! 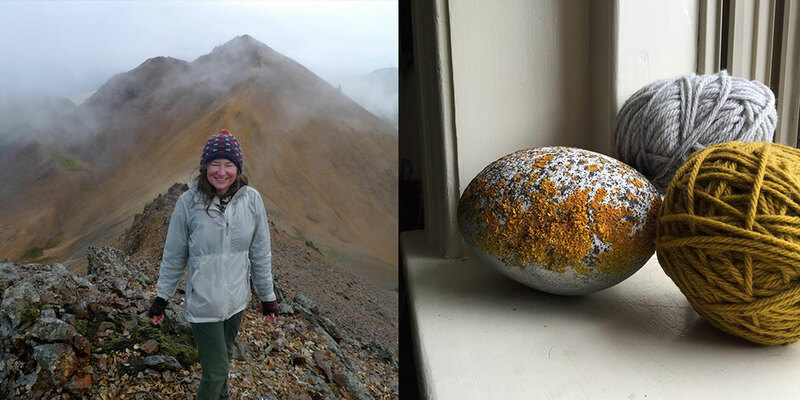 Great interview- I would love to do one of her Shetland tours one of these days. MMMM I wonder if this Shetland wool, hat kit keep me warm while hiking in North Wales ? I would love to knit this and wear it while hiking. Awesome Story. Thank you for sharing. I’ve been eyeing this book for a while now, a win would be perfect! Another fascinating story! Would love to go on one o her tours! Really enjoyed this episode! Wishing I could head off to Shetland right now. 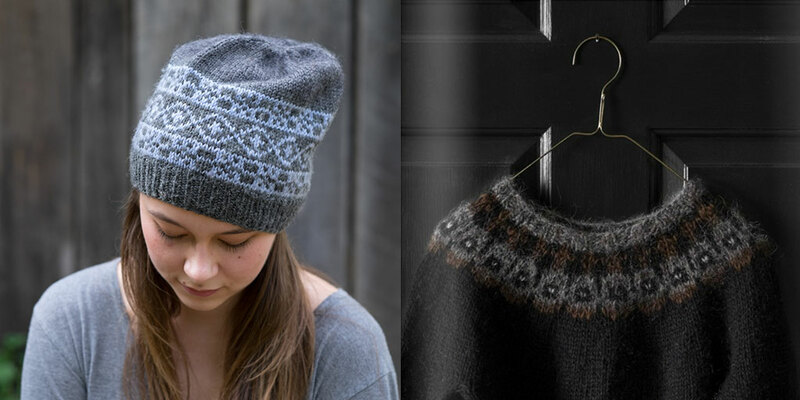 Going on a tour with Mj and Gudrun Has to be on the top of almost every knitters wish list.. Wonderful podcast! I recently borrowed one of Mary Jane’s books from the library, didn’t want to return it, would definetly enjoy owning one of her books! Fairisle sweater is something I will knit someday. Thanks for a great podcast! What a great first episode to listen to! I can’t wait to listen to more. Listening to this episode as I embark on a stranded and intarsia Christmas stocking was the perfect inspiration! So far I haven’t been a colorwork knitter but I would love to learn the techniques. Lovely podcast. Discovered your podcast today. What a discovery! 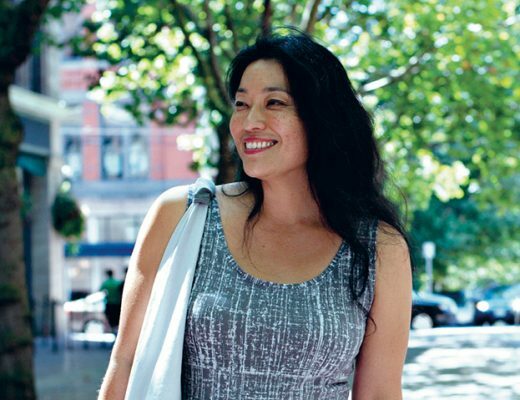 I love the interview with Mary Jane, and will listen through the old podcasts, too. Congrats on your 50th podcast. I so enjoy listening to your episodes and it always feels like being in the room with you and your guests. It’s super interesting … now I want to go to Scotland to explore more. 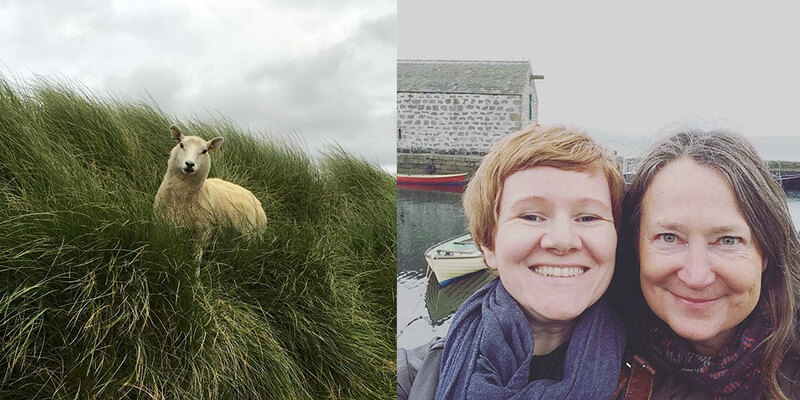 I adore the thought of walking around Shetland with these knitting legends! Another great episode. Love this episode! The joy you both bring to your work is inspiring. I just finished listening to this podcast and learned so much. Thank you! I was totally in shock when I’ve realized that the book I’ve borrowed recently in the library was written by Mary Jane talking on this podcast! Wow! What a coincidence! I’m incredibly excited to listen to this latest episode. I love hearing what Mary Jane is up to! I’m always astounded by her color work. What a great episode! I love hearing about Mary Jane’s fiber journey. Another great episode! I am always looking forward to more! Inspiring interview! Having lived in Finland for a year, the Scandinavian colorwork details were especially interesting! I always love hearing someone’s story/personal journey. Thanks for sharing. so fun to listen to Mary Jane tell her stories. I’ve been a big fan of Mary Jane for a while and it is nice to experiance her voice. 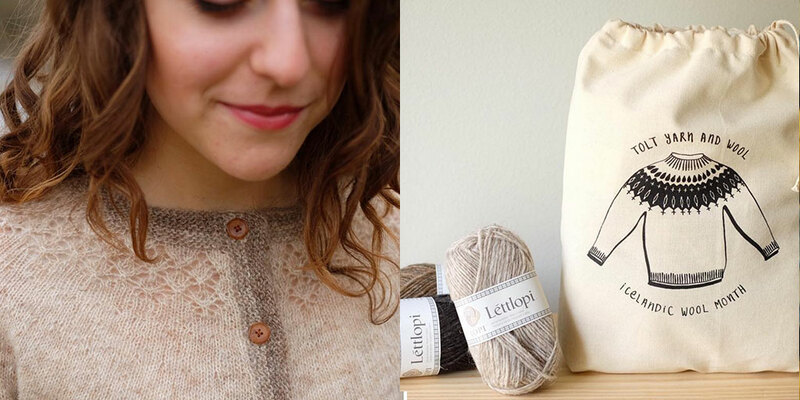 Loved listening to this yesterday – after listening, I randomly came across the Bang Out a Sweater knitalong on Instagram. I’ve been wanting to learn to knit a sweater and this seems like the perfect one! A great episode. I love Mary Jane’s Craftsy class “The Fair Isle Vest” and her book “200 Fair Isle Motifs”. Thanks for another inspiring podcast. I love learning from you and your guests! Lived this podcast, I met Mary Jane at VKL In Chicago took one of her lecture class and saw all her beautiful samples. Your interviews never disappoint…thank you! How great to hear of the Andean knitting as well. It was lovely to listen to this podcast as I cast on something new after frogging a colorwork project. (Another lesson in gauge!) Love Scandinavian patterns and Mary Jane never fails to inspire. Another very interesting podcast and a generous giveaway. I MUST get to Shetland on my next visit to Scotland. It really is all about the wool- and the people, and the scenery and etc. I can’t wait to take a class from Mary Jane at Squam in June! I really enjoyed hearing Mary Jane’s stories about her connection to textiles and yarn in the US to her journeys around the world. I loved listening to the bits of history. Thanks for a great podcast! This episode made me both really want to travel more and immediately pick up some colour work! So inspiring! Thank you for another delightful story. Thanks for this inspiring and colorful new podcast ! Have a nice day ! I’m planning a trip to Iceland this summer, i can’t wait to immerse myself in their knitting culture. Such a great interview! 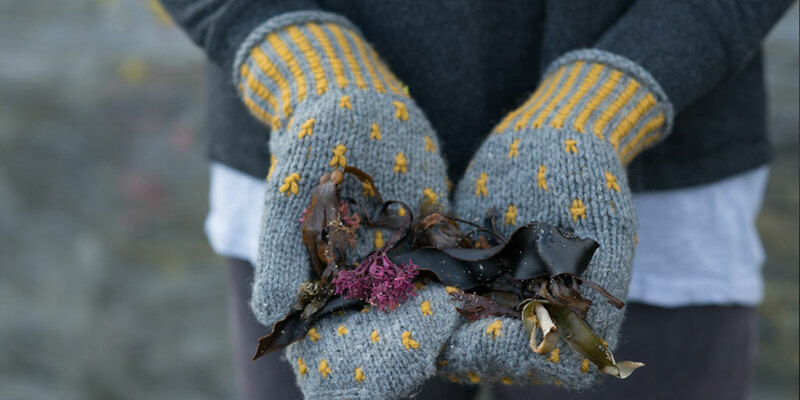 I learned so much – I’ve wanted to do Fair Isle knitting for so long and this gave me the inspiration to really learn to do it now. Thank you. i loved hearing mary jane talk about her adventures; especially peru. thanks for putting all this up. MJ is a great story teller, I was enraptured by every twist and turn, along the color work of her life. It’s curious to see how MJ describes the peruvian way of knitting for that’s how we knit in Portugal. The yarn goes around the neck so it comes from the front of your work, making it easier to purl. It is very intuitive once you´ve learned how to place the yarn. And it gets tension off your fingers making it a bit easier for knitters suffering from painful joints on their hands. Some historians say these south american knitters got this technique from ancient portuguese explorers, but i wonder if it could have been the other way around…? I love Shetland wool. 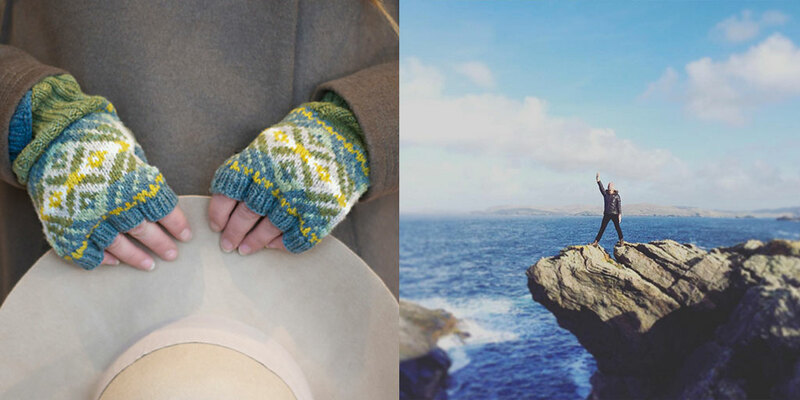 It’s definitely on the bucket list to get to the Shetland Islands some day, during Wool Week or the summer months. Love that MJ is planning holidays with more walking in them as that’s a huge passion of mine too. Lovely interview. Another great podcast. I’m completely addicted to these. Loved this podcast episode! I’ve been following Mary Jane on Instagram for a while but never knew her amazing background. I would love to go on one of these trips. Will put on list for future with many other sweet dreams. Thanks again for wonderful podcast. I have had the best day catching up on the last three podcast’s while it pours outside and I sit and knit next to the fire. I have been working on a scarf using two colors of the same sock yarn feeling oh so clever, then I listen to this and realize I have so very much to learn and explore. But it’s the kind of learning something new that I can’t wait to do. I will have to listen to this one again so I can google/Ravelry search all those names and techniques. Even the geography lesson sounds intriguing.